Atheists in the U.S. complain about all sorts of things. We live in a country where more than 70% of the adult population and well over 90% of Congress identifies themselves as Christian, so it is not surprising that we'd have some complaints. We each have our pet issues, but we also have quite a bit in common in terms of the things that bother us and the sort of changes most of us would like to see. How would you like to hear significantly less pandering to the religious from political candidates and elected officials? How would you like to see a more secular government engaged in far fewer church-state violations? How would you like to see our elected officials adopt a real commitment to reality-based policy? Sounds pretty good, doesn't it? I think we can make it happen if we are willing to commit to doing just a couple of fairly easy things. In this post, I am going to recommend two things to help bring this about. We should vote in every election and not just the presidential ones. I don't care who you vote for; I'd just like to see a large improvement in the turnout of secular voters. I know you aren't used to hearing this, so let me say it again to make sure we understand each other. Even if you prefer a different political party or candidate than I do, I still want you to vote. I'm not going to tell you who to vote for; vote your conscience. Just vote. Now let me explain why I am asking you to do this. As you know, we received some good news recently about the rise of the religiously unaffiliated here in the U.S. The problem is that the religiously unaffiliated are nowhere near as likely to vote as White evangelical Christians. Our numbers are comparable, but we are far less likely to vote. We need to change that if we want to be taken seriously by candidates running for office and elected officials hoping to keep their offices. I am not suggesting that we attempt to form a voting block so we all vote in the same way. We are too politically diverse for that, and that's fine. What I want is for all the political parties to see us as a group to whom they must begin to cater if they want to maintain political viability. To do that, we need to increase our voter turnout. You have seen the attention the U.S. Religious Landscape Study has received, and you are well aware of how much attention elections receive. Can you imagine what would happen if voter turnout among religiously unaffiliated voters doubled during the 2018 election? Can you imagine how different things would be if the number of religiously unaffiliated voters begin to eclipse the number of White evangelical Christian voters? Again, I'm not talking about specific parties or candidates winning elections; I am talking about making it clear that no viable candidate can afford to continue to ignore us. The #AtheistVoter campaign was a step in the right direction, but this should be a year-round effort that is much broader than Twitter. It is also something we should do at every level of government, from our local school board elections all the way up to the U.S. president. We need to let office holders and candidates know that plenty of secular voters are out there and that we are paying attention. You are a constituent of their district, state, or country (i.e., you have the capability of casting a vote for or against them). You plan to vote (i.e., you are an active participant in the political system). 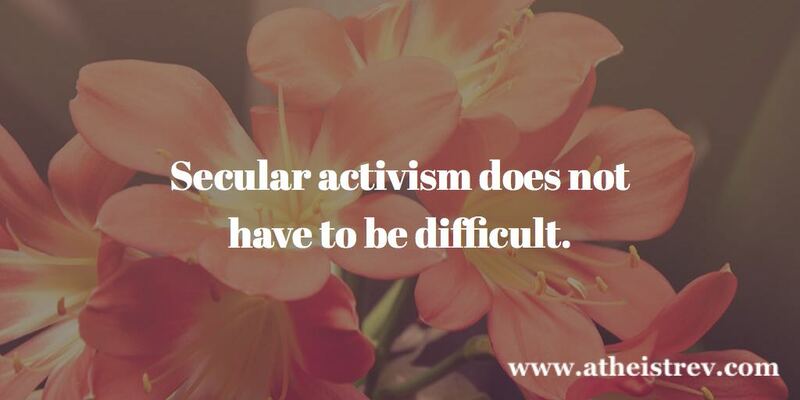 You are a secular person. Identify yourself as an atheist if you want, but the key is to be clear that you are not religious. You are paying attention to them and their record on whatever issues you consider important (i.e., you are engaged and interested). Dear Rep. Christian, As a non-religious voter in your district who plans to vote in the upcoming election, I was disappointed that you supported the recent effort to plaster "under god" all over the state capitol. Efforts like this lead me and other secular voters to feel that our interests are not being adequately represented. Separation of church and state is an issue of vital importance to me, and I hope to see you support it in future votes. As we work to increase the turnout of religiously unaffiliated voters, contacts like this will begin to have a greater impact. Politicians will see evidence that we are showing up to vote, and they will have to take us more seriously. In the meantime, contacting our elected officials and those running for office will make it impossible for them to claim that they have no secular persons among those they are supposed to represent. We will all have our ideas for what victory might look like, but I'd like to suggest something simple. Victory looks like political candidates asking themselves how they can do a better job of appealing to secular voters. It means that their campaigns will need to expend some effort learning about us, understanding the issues that are important to most of us, and recognizing that they need our support.